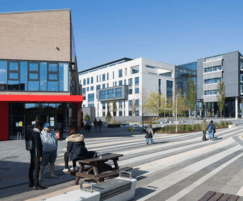 Urbastyle supplied a range of Wood-line straight benches and seats for Bristol Business School at the Frenchay Campus, UWE Bristol's main campus, located four miles north of Bristol city centre. 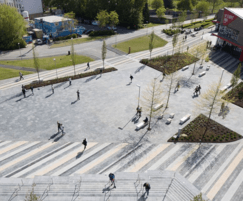 The benches were positioned at the meeting point of the UWE students' union building and the Bristol Business School to create a convivial meeting place for students in this area. The contemporary Wood-line benches and seats are manufactured from Ultra High Performance Concrete in White colourway and have sapele timber slatted seats. They also have an anti-graffiti coating. A waterproof finish helps to keep the seats usable, even in wetter weather conditions.